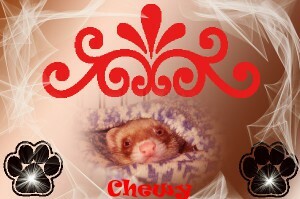 Here are some cool ferret facts: Male Ferrets are twice as large and three times heavier than the female Ferret. This enables females to eat less and feed the babies. All weasels have long flat skull that enables them to give a powerful biting force, which is proportionally the strongest in mammals. Ferrets’ teeth can bite through a pencil. Ferrets and Weasels can see well up close and are better than people in noticing movement or shadow, but cannot see in the distance. (They don’t need to, because they are adapted to hunt animals in dark burrows.) Besides Ferret’s eyes have to be small to keep the dirt and injuries to a minimum, and block light absorption. The Ferrets’ body is quite long with short legs and a long, strong neck, which enables the Ferret to carry the catch 2-3 times his body mass at very fast pace without tripping over it. The vertebral column of Ferrets is long and supple, allowing the animal great flexibility in changing directions while running. The muscles along the back release a great deal of energy permitting Ferrets and Weasels to reach high speeds and leap 2-4 times their body length. Weasel’s elbows and wrist bones have extensions on the end to make the arms very strong for digging and climbing. The short Ferrets’ legs are good shock absorbers, which allows leaps exceeding 10 times the body length without injuries.